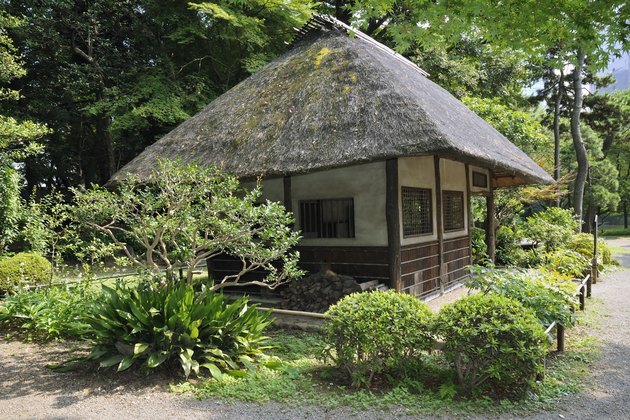 Japanese house construction methods evolved for more than a thousand years to suit the requirements of a four-season climate with moderately cold winters and very hot, humid summers. To facilitate air movement, traditional Japanese houses have movable partitions instead of walls, and they have raised floors. None of this sits on a foundation -- it is all attached to the posts that support the roof. Skilled carpenters assemble the posts and beams with precise joinery. Traditional straw-roofed houses in Japan. Construction of a traditional Japanese house begins, not with a foundation, but with posts erected on a pad of packed earth. They are connected with horizontal beams that support the roof, and the frame is stabilized with diagonal braces -- a modification that accompanied the introduction of foreign building methods to Japan. The floor is connected to the posts and suspended several inches above the ground. In some parts of the house, the floor is framed with joists to accept a covering of wood planks, but in the living room, bedrooms and entry, it is framed to accept straw mats, or tatami. Carpenters traditionally frame houses using wood from the species Cryptomeria japonica, a close relative of cedar that the Japanese call sugi. Like the true cedars, this wood is stable and resistant to decay. Straw roofs were common in the past, but more recently, builders use ceramic tiles known as kawara to provide shade and protection from rain and wind. Even if there is no straw on the roof, however, there is certain to be straw on the floor in the form of meticulously constructed tatami. Besides wood, straw and ceramic, Japanese houses also contain a material that no western builder would consider a construction material -- paper. Because they don't have to support the roof, the walls in a Japanese house -- including the exterior walls -- can be lightweight and moveable. They usually consist of frames for shoji, which are the iconic paper-covered sliding doors universally recognized as Japanese. Like the frame of the house, shoji are usually made of sugi, and the paper -- known as washi -- attached with water-soluble rice glue. Traditional houses have both exterior and interior shoji; the air gap between them provides extra insulation in the winter. In the summer, all doors can be fully opened, allowing a breeze to circulate throughout the house. When plywood became available, Japanese carpenters began to use it to cover walls in which no shoji were installed, and they stopped using woven bamboo for this purpose. Among the materials they use to decorate it are clay, diatomaceous earth and wara, which is woven straw. 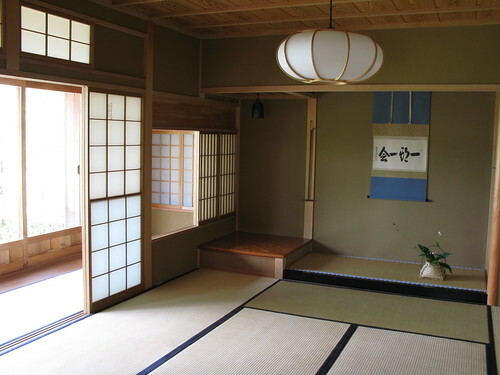 Sliding doors are an idiosyncratic feature of Japanese houses, but modern exterior ones are usually made of glass and metal and are lockable. Moreover, because not everyone can afford to install hand-planed floorboards, modern houses in the traditional Japanese style often feature kitchen floors covered with vinyl, carpet or tiles.